View our photo slideshow and picture your perfect event at White Willow. A wedding at White Willow Estate is a magical experience. 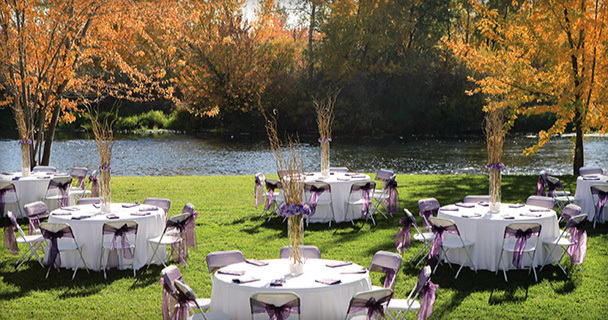 Boasting two picturesque, outdoor ceremony and reception venues, White Willow affords an event rich with romantic elegance and a stunning proximity to the Boise river. White Willow Estate invites you and up to 500 guests to celebrate life, laughter and love on your wedding day. This really is the ideal setting for the perfect wedding — just what you've always wanted. White Willow Estate is the cure to the common party or event. We are the perfect location for corporate and social occasions alike. This dazzling spacious property features multiple spaces to accommodate any group or any type of occasion. Whether you are looking for an elegant dining experience, a festive cocktail or holiday party, a memorable class or family reunion White Willow Estate is the place for you. The breathtaking views along the river's edge, elegant waterfalls, luscious landscape and spacious privacy will captivate you and your guests. You will know you are somewhere special when you arrive at White Willow Estate. Special Wedding and Event Pricing. Call to find out more! Rehearsal, Ceremony and reception. Bridal Casita for dressing, Valet parking, Gift, DJ and Guest Book Tables, and Chairs and Tables.